Running isn’t kind to my body, but I didn’t realize that when I was 22. I ran SO many races. I just thought everyone recovered for weeks after a race because of sore knees. Once I acknowledged that I just couldn’t do the longer runs without damaging my knees, I became much more aware of what exercises were better for my body and knees. I still run a few times a week, but I no longer do crazy plyometric workouts or anything that requires constant pounding for an extended amount of time. Almost all of my clients have some type of ailment that we work around. Working out is not an all or nothing option – you can still work out even if you have an injured area or irritated muscle/joint. Sign up with your email address to receive a pdf with knee-friendly strength training workouts. Thank you! Please click here for your free download! 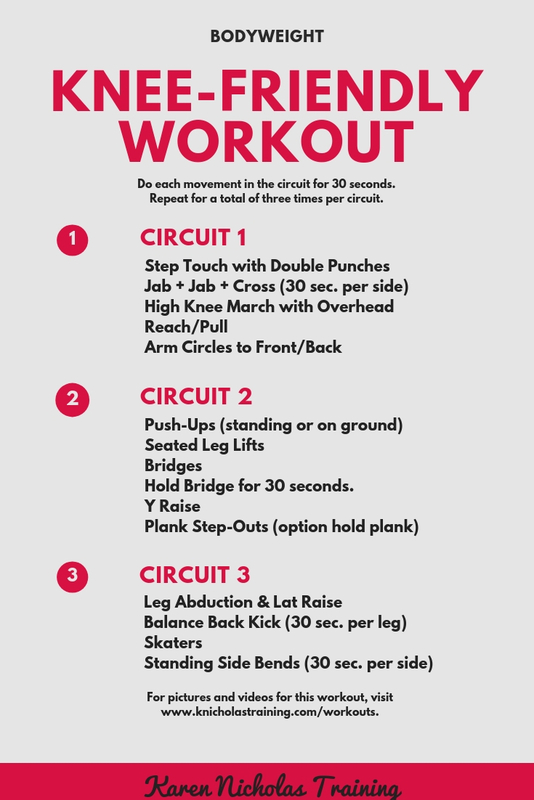 Complete each workout move in the circuit for 30 seconds. Repeat the entire circuit for a total of three times before moving on to the next circuit. Bridges for 30 seconds; hold bridge for 30 seconds.